Ladies and gentlemen. Boys and girls. I’d like to introduce you to my new favorite potato side dish. Seriously, guys, I have made this twice in the last 2 days because they are so amazing and SO easy. I even recommended this to my sister who is not only semi-clueless in the kitchen (I can say that because I know for a fact she doesn’t read this blog…let’s just hope other family members don’t rat me out here! ), but she’s also friends with non-gushy people who apparently gushed over these potatoes. 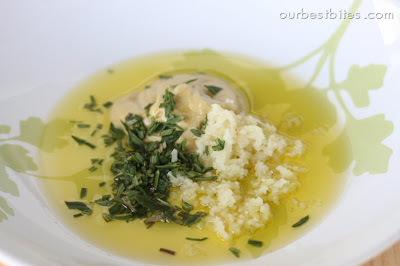 This recipe is elegant, super quick and easy, and it uses up that pesky rosemary you have growing in your herb garden. 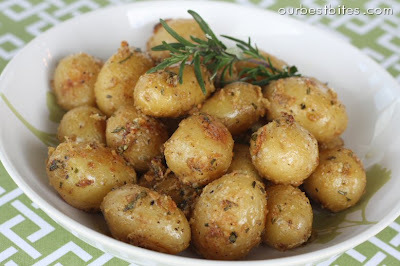 Don’t be scared of the sheer amount of garlic and mustard; when you roast the potatoes, it will dramatically mellow the flavors, particularly the mustard–in fact, I seriously doubt you’d recognize the flavor as mustard. Bring a large pot of salted water to a boil. While the water is heating, combine olive oil, minced garlic, rosemary, mustard, and some black pepper. Set aside. When the water is boiling, add the potatoes and boil for about 10 minutes or until they are easily pierced with a fork. Drain, return the potatoes to the pan, and then toss with the mustard mixture. Now…this is where the beauty of this recipe comes in. You can either do all of this ahead of time and then refrigerate the potatoes until you’re ready to finish them off or you can do it all at once. Either way, you’re not going to spend more than 30 minutes tops making these beauties and they’re so elegant that you could seriously serve them at the fanciest dinner party. So…if you’re making these right now, preheat your oven to 425 and line a baking sheet with aluminum foil. If you’re saving them (for up to 6 hours), line the baking sheet and spread the potatoes out evenly and then cover them with plastic wrap and refrigerate them until you’re ready to bake them. When you’re ready to bake these guys and the oven is hot, sprinkle with Kosher salt. Bake for 10-15 minutes or until the skins are browning and sizzling. For fancy presentation, place the roasted potatoes on a platter, scrape those delicious bits off the foil, sprinkle them over the potatoes, and then garnish with a few sprigs of rosemary. Those look delicious! And lol about the pesky rosemary…I planted some but still haven't used it for anything! Now I have a reason to though!! 🙂 Thanks for the recipe! Looks wonderful! And I think I'm in the "creepy" camp. On of those pudgy fingers is pointing right at me! Do you really think Rosemary is pesky?? It's my faaaaavorite herb. I have 4 plants because I use it so much! I'll definitely make these- they sound awesome! I love cooking with fingerling potatoes, if I can find them around here that is. These look wonderful! Oh for Pete's sake, (who is Pete anyway?! ), how can one woman keep up with you and all these amazing recipes?! LOL LOL I'll add this to the list of things to whip out today along with the Taco Chicken, White Chicken Chili. Made the Puffed French Toast w/Buttermilk Syrup this morning for some of the missionaries. They are now happily in sugar induced commas, and I'm concerned there will be no work done today at the Mission Office:) I'm blaming it on you:) I LOVE rosemary and cook with it as much as possible in hopes that my triplets will grow to love it as much as mom. YOU ARE THE BEST!!! Nah, I don't think it's pesky; only when I have way too much of it and I don't know what to do with it!! Lemme just tell you I could eat a plate full of those babies as my whole meal. They look delish! oOoo i looove rosemary too!! probably my all time favorite herb! However my rosemary did NOT grow this year.. so i'm stuck with dried? do you think this would still work well with dried rosemary? Where the heck do you get the fingerling potatoes??? Walmart has them. There has to be a Walmart pretty close to just about anyone. If not, any high-end grocer should have them. I love fingerling potatoes with a standing rib roast, eye of round, sirloin or sirloin tip roast where the roast is on a rack and the potatoes are on the bottom of the pan, soaking up the savory drippings. Yum! Ellen–I got mine at Kroger. I looked for some yesterday at Walmart, but there wasn't even anything close. Really, any very small potato will work perfectly! trying these tomorrow for dinner. i went to get the finger potatos but do you think i could find them? nooooooooooo… so i got red potatos. i'll let you know how they work. love ya! made the potatos last night and they were a big success! thank you! while they were cooking the smell itself was delicious! These potatoes were SO yummy!! I love 'em! I made this the other day and I couldn't help myself from eating half of the potatoes before my husband got home for dinner! Just made these for the family, they were a hit! Even the picky 9 year-old ate them up! These are seriously one of my very most favorite side dishes! I'm embarrassed that I haven't commented about them before. I make them ALL THE TIME! I usually just chop up red potatoes. And I even skip the boiling. I'm sure it's a good idea, but I don't know if anything could make these any better than they already are. Because I don't boil them, I do end up cooking them significantly longer. But they are divine! I made this tonight along with the Rotisserie Chicken. Have to say I couldn't stop eating theses potatoes! Seriously this recipe is amazing. I have made this several times now. Thank you! LOVE these! My kids do, too. Another winner. Thanks! Love ’em! Making them again this evening! I made these tonight…SO good! My husband and I have loved every one of the recipes I’ve made from your blog. Thank you! 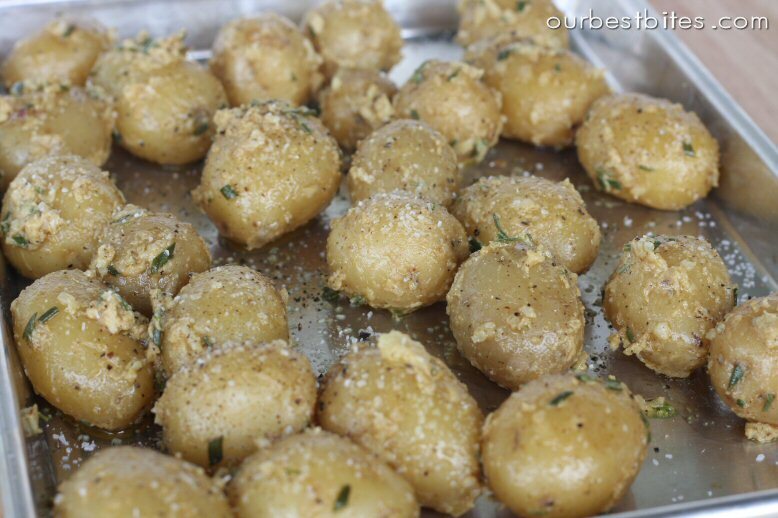 Would this recipe work with regular potatoes cut up to bite size? I’m sure it would! I’m definitely partial to creamy potatoes like Yukon Golds or red potatoes in this recipe, though. I made these with red potatoes tonight, they were delicious! Just be careful not to boil them for too long like I did…. Made these tonight w/ fingerling potatoes, and they were delicious. In the words of my 5 yo, as they were roasting, “Momma, what smells so good? It’s making me want to have a taste of it!”. She was not disappointed. Thanks for another great recipe! I made these tonight…they were awesome! The baked on bits on the pan were so good! I will definately make these again!!! Quick question: about how many people do you think this will serve? I was looking for another side dish to bring to our family thanksgiving and I think this is the one. 🙂 Thanks again for another awesome recipe! @Stephanie, I’ve made a version of these potatoes on the gril. Usually, depending on their size, one can handle about 3 potatoes (but they’re so good that you CAN NOT stop eating them.) I would guestimate (based on the amount on the cookie sheet) these would serve about 8-10 people. I hope this helps you estimate the amount when you buy them. Would the garlic and herb mixture burn if these were roasted longer, I wonder? 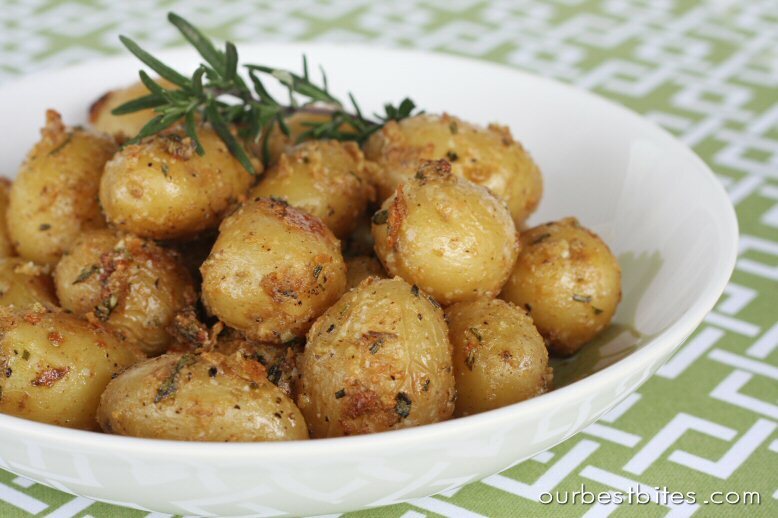 All other recipes for these little roasted potatoes have the oven time closer to 40 minutes, to get a crispy skin and creamy center. 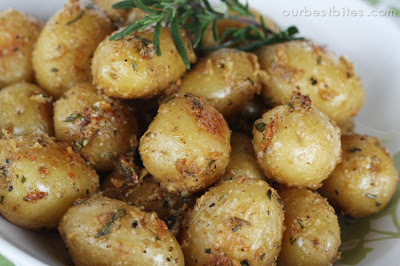 Yep, the garlic would probably burn–boiling the potatoes helps cut down significantly on the roasting time while achieving that creamy center. This sounds great and I want to try it for Christmas! How many servings is this recipe for? I’m only cooking for 15.